There are certain forms of organization which is created, with an aim of providing services to the members, rather than earning a profit. Trust and society are two such organizations. Trust is a legal arrangement in which a person holds property for the sake of some other person. Society is an association of person, who come together to fulfill any particular purpose, described under the act. The basic distinguishing feature in the two legal persons is the purpose for which they are created, and once you know the purpose, you can easily differentiate a trust and a society. To create a trust, there must be at least two persons required, whereas a minimum of seven members are required to set up a society. 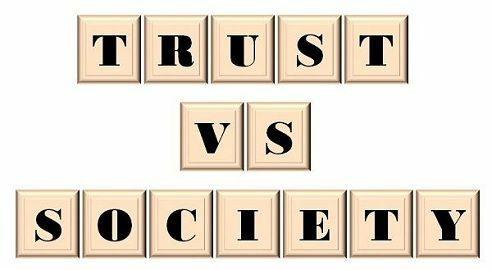 In this article excerpt, you will find all the substantial differences between trust and society, take a read. Meaning A legal relationship, in which author assigns property to the trustee for the benefit of the beneficiary. A society is an organized group of persons, who are joined together for fulfilling any purpose relating to literature, science or charity. Governed by Board of trustees Governing Body which should be directors, governors, trustees etc. Trust is a legal entity, created by one party, in which the second party has the right to hold the assets of the first party for the benefit of the third party. Here, the first party refers to the author of the trust or trustor; the second party is known as a trustee, who accepts the proposal of trust and maintains the property of the trustor on behalf of the beneficiary (third party). The subject matter of the trust is known as Trust Property, and the document in which all the terms and conditions regarding the trust are written is known as a Trust Deed. Living Trust: The formation of confidence by the author when he is alive. Testamentary Trust: The trust which comes into existence, after the death of the author. Revocable Trust: The trust which can be revoked or modified by the author is known as Revocable Trust. Such kind of trust becomes irrevocable if the grantor dies. Irrevocable Trust: The trust which is irrevocable in nature is known as an irrevocable trust. Society is a group of persons who are associated together for a common purpose. The purpose may be related to promoting any literary, charitable or scientific work. The incorporation of a society is very simple which requires minimum seven members who sign the memorandum of association (MOA) and then files it to the Registrar of Companies (ROC). In this way, the society is legally formed under the Societies Registration Act, 1860. The memorandum contains all the details related to the name and the object of the society. In addition to this, the memorandum contains the names, addresses, and profession of the governing body and its members. Committee, governors, directors, council, trustees and others, are the part of the governing body of the society. A trust is an agreement between parties, whereby one party holds an asset for the benefit of another party. Society is a collection of persons, who come together for the initiating any literary, scientific or charitable purpose. Trusts are registered under Indian Trusts Act, 1882 while Societies are incorporated under the Indian Societies Act, 1860. There can be minimum two members in a Trust, whereas there should be minimum seven members in society. Trust Deed is the root document, in the case of Trust, but in the case of the Society, the details are provided in the Memorandum of Association and Rules & Regulations. There is a single man control in trust. However, there exist a democratic control in the society where decisions are taken by voting. The board of management of trust contains trustees, but in the case of society, there is a governing body which comprises of committee, trustees, council, directors, governors, etc. The purpose for which a trust is created is that a person will hold the property of another person for the benefit of a third person while society is set up to promote any scientific, literary, charitable and similar another objective. The purpose of the two differentiates them. Nice article which clarifies the differences between a Trust and a Society and their salient features. Thanks. The trust created for a society registered under Societies Registration Act, 1860 is created under which act? Societies registration act or Indian Trust Act? It’s clarifying the confusion. excellent work is done. How about the religious congregations. are they good to be registered as society or trust? So please giude with your studies and expreince. Can a temple trust of a community come under this rule? Can a temple trust collect money from public and different profitable businesses? Kindly suggest. Can any body guide on the Compliance required for the societies registered under the Indian Society Act 1860. I went though your website,nice content very helpful. waiting to see more posts from you.